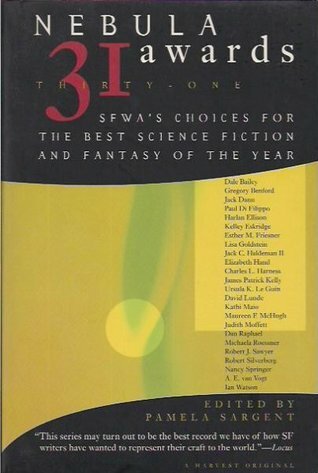 This is the last volume of Pamela Sargent’s stint as the Nebula anthology editor, which is unfortunate because she excels at editing these types of varied story collections (such as her Women of Wonder series). There’s more work involved in editing a volume like this than you might think–given a limited amount of space, trying to cover an award that is for novels as well as short stories, one must carefully pick and choose. 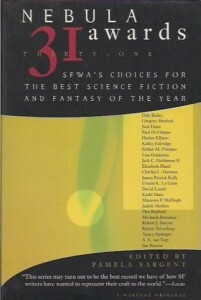 It will be interesting to see who SFWA finds to replace her. “Solitude,” Ursula K. Le Guin — I am not a big Le Guin fan–in fact, you could say that I dislike most of her work excluding the Earthsea books. So, when I say that I enjoyed a Le Guin story then it must be special indeed. “Solitude” is a story of culture, one alien to our own. Le Guin posits a world in which past overpopulation has led present society to become the ultimate introverts. Not only do the women live apart from the men (as seen in many feminist SF stories in the past), but they live apart from each other. But it is the method of the story, putting a young child in the place of the observer, in which Le Guin achieves something new here. “Death and the Librarian,” Esther Friesner — Except for the early part, in which the chameleon-like nature of Death is revealed, this story plods along. When it comes down to the talking heads at the end, I was ready to toss it across the room. Sure, Friesner can write welt enough, but this doesn’t have anything Nebula-worthy to it. A disappointment. “Alien Jane,” Kelley Eskridge — A nice SF tale, taken from the pages of Oliver Sacks, or at least, that is the way it reads to me. Well done, with a satisfying ending. “Think Like A Dinosaur,” James Patrick Kelly — I haven’t road a story this good in a long time! This is the kind of tale that can only be done in SF. Basically a study of what “true” matter transportation would be like, including what the hard choices would be. The result is the best short story I have read in two years. “The Lincoln Train,” Maureen F. McHugh — An alternate history story with its jumping off point being the survival of Lincoln, except as a handicapped president. The concept is interesting, and the story has a nice moral center, but there was nothing that truly thrilled me here. “The Resurrection Man’s Legacy,” Dale Bailey — A baseball SF tale, reminiscent of Bradbury in its nostalgia and feeling. I was never a Bradbury fan, especially of his warmed over reminisce s of the 5O’s, plus I dislike the reverence people give to sport (as opposed to games), so this one really didn’t stand much of a chance with me. “You See But You Do Not Observe,” Robert J. Sawyer — Physics and Sherlock Holmes? Okay, so it was a cute idea, but this is a best of the year. I trust that Sawyer’s novel, which did win the Nebula, was much better. “Enchanted Village,” A.E. Van Vogt — A story from the Grand Master, possibly a little long for the result, but at least it is a result worth reading for. A spaceship crashes on Mars, leaving one lone survivor, who finds a deserted Martian village. The Village may be able to provide for him, but only if he can somehow teach it his needs. Good ending. “Old Legends,” Gregory Benford — A memoir and essay about SF’s role in society, especially American government policy, this was entertaining and enlightening. Benford’s goal in this essay is to justify the long held claim by SF fans that stories lead to science just as much as science leads to stories. While I have my doubts about SF’s influence today (especially in these times of endless Star Trek novels), Benford shows that it was a very powerful force in the not-so-distant past. “The Narcissus Plague,” Lisa Goldstein — Cute idea–what if there was a virus that, when you caught it, all you could do was talk about yourself? I liked the conceit, and the story showed promise, but the ending was disappointing. “Last Summer at Mars Hill,” Elizabeth Hand — A nicely told tale of death and unknown beings. Its power comes not from the fantasy element, but from the portrayal of the characters, each well-drawn and believable. The writing and characterization was so well done that I really wanted to like this story more, but it lacked that sense of the fantastic that I expect from a fantasy story. Great mainstream work, I just want more in my fantasies. Overall, this was a very rewarding volume. Of the stories, Kelly’s “Think Like A Dinosaur” was such a gem, that I will likely be recommending it for years to come. The other highlight was Benford’s essay.